Firefighters fight a building fire after a gas leak lead to an explosion in Durham, NC, Wednesday that left one dead and 15 injured. 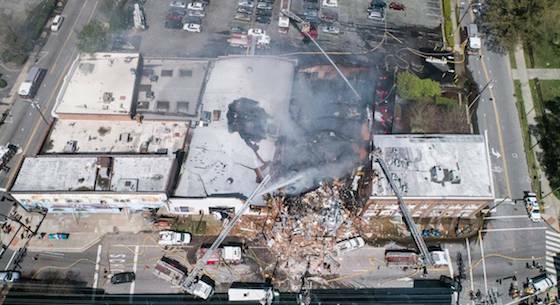 One person is dead and 15 have been taken to the hospital after an explosion and partial building collapse in downtown Durham, NC, Wednesday morning, police said. Durham firefighters and Dominion Energy crews responded to a call about a gas leak at 9:38 a.m., Durham city officials said. A contractor was burrowing under a sidewalk near 115 N. Duke St. and hit a 2-inch gas line, “which caused an explosion and a partial building collapse,” Glenn said. The explosion happened just after 10 a.m., sending flames and a plume of smoke high into the air and turning the building into rubble. People were asked to avoid downtown. Witnesses nearby reported hearing and feeling a loud explosion that broke window panes and sent debris into the street. The area is filled with several businesses and restaurants. The 115 N. Duke St. address is home to a coffee shop called Kaffeinate and a company called Prescient. Students from nearby Durham School of the Arts were dismissed early, according to Durham Public Schools. No injuries were reported in the school building, the district said. The school is one block away from where the blast occurred. Dominion Energy said it has cut off gas to the area.